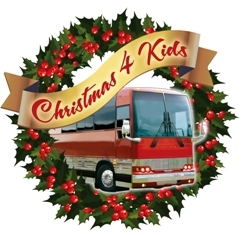 Christmas 4 Kids (a division of Christmas For Kids, Inc.) is a 501(c)-3 Non-Profit Organization that was created in 1982, originally called Christmas Caravan. In 1992, the name changed to Christmas For Kids, Inc. For over twenty years, Christmas 4 Kids has given the joy of Christmas to thousands of Middle Tennessee children that might not otherwise experience it. Each December, local businesses, volunteers, celebrities, recording artists, and their bus drivers set aside two days from their busy schedules for these special children. The season for giving kicks off every November with the Charlie Daniels and Friends Concert to benefit Christmas 4 Kids. The concert is the cornerstone of Christmas 4 Kids’ fundraising efforts. 2012 featured performances by Thompson Square, Phil Vassar, Rodney Atkins and Charlie Daniels. Click on Artist's name to jump to that album or scroll down to see all.